This year’s World Elder Abuse Awareness Day occurs on June 15, quietly proclaiming a dirty little secret that isn’t so little after all: It’s the same day every year. “Abuse” takes many forms, and I can’t forget the verbal abuse of my mom by one of her caregivers. When Mom complained about how “just horrible” her life was with this individual, at first I was skeptical, for Mom had Alzheimer’s. “Sue” talked back to her in a rude, impatient and demeaning tone, even in front of me. I wondered how often it happened when no one was there. According to the National Center on Elder Abuse (NCEA), research indicates that more than one in ten elders may experience some type of abuse, but only one in five cases or fewer are reported. This means that very few seniors who have been abused get the help they need. Some experts in the field call it an overwhelming, devastating problem. We boomers can’t help but wonder: Will this happen to us? And now, how do we prevent it from happening to our parents? First, let’s define the term. NCEA says that in general, elder abuse refers to intentional or neglectful acts by a caregiver or “trusted” individual that lead to, or may lead to, harm of a vulnerable elder. The types: physical abuse; neglect; emotional or psychological abuse; verbal abuse and threats; financial abuse and exploitation; sexual abuse and abandonment are considered forms of elder abuse. In many states, self‐neglect is also considered mistreatment. Elder abuse awareness lags domestic violence and child abuse. I’m lucky to have a gem of a resource nearby. It’s the Center of Excellence on Elder Abuse & Neglect at the University of California, Irvine. The geriatrics program at UC-Irvine’s School of Medicine houses the center. “We say elder abuse is 20 years behind both domestic violence and child abuse,” says Mary Twomey, the center’s articulate and dedicated co-director. When it catches up, we could be hit by a tidal wave. To learn more, please check out this comprehensive list of resources amassed by the center. 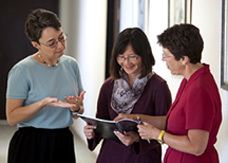 UCI’s Center of Excellence on Elder Abuse & Neglect is home to national experts. *Caregiver: higher anxiety, more depressive symptoms, fewer social contacts, greater perceived burden, as well as two other measures of poor emotional well-being from a widely used survey. *Person with dementia: more psychological aggression (for example, swearing at the caregiver) and any physical assault (for example pushing or shoving the caregiver) behaviors. No matter the reason, elder abuse is totally unacceptable. How to report suspected abuse? First, contact your local adult protective services agency. State reporting numbers are available at the NCEA website or call the Eldercare Locator at (800) 677-1116. Of course, it you encounter a life-threatening situation, contact 911. Abuse in a nursing home or long-term care facility necessitates interface with state specific agencies. Search at the Long-Term Care Ombudsman website. Help is where you find it, so report it: YOU don’t have to prove abuse, for investigators are charged with that. Your gut is usually right. Trust it and trust yourself.